PITTSBURGH—University of Pittsburgh fraternity and sorority members and University of Pittsburgh Cancer Institute (UPCI) leaders will celebrate the completion of Pitt Fraternity and Sorority Life’s pledge through its donation of more than a half-million dollars to UPCI at a Recognition Reception from 6 to 8 p.m. Dec. 8 in the O’Hara Student Center, 4024 O’Hara St., Oakland. In 2005, Pitt’s fraternities and sororities pledged to raise $500,000 for UPCI. According to Summer Rothrock, coordinator of fraternity and sorority life at Pitt, the Greek organizations held a variety of fundraising events during the past six years to help them reach their goal. The Greek Week activities included Greek Sing and the Pitt Dance Marathon. In addition, the organizations partnered with the Central Blood Bank to hold numerous blood drives on campus. 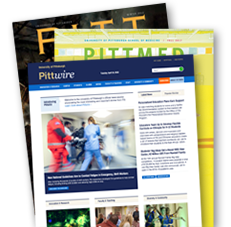 Pitt became one of the top donors in the area. Other events hosted by various chapters ranged from galas to dunk tanks, from pie-a-thons and bike-a-thons to bake sales and “canning” at Pitt athletic events. For more information, contact Shawn Ahearn at 412-648-1005 or ahearn@pitt.edu.